I’ve been keeping busy with Stitch ‘n Time at work (the volunteer textile club that processes the wool from our sheep), which has mostly meant helping to revamp the wool and tool logs, so we know where everything is and who is working on it. Between 2013’s Winters Eve sales and providing items for a few gifts and giveaways, we’ve managed to go through a good deal of the club’s inventory – both spun wool skeins and finished knit/crochet items. Since sales of the finished items are what help support that particular program, we had a lot of work ahead of us, getting back to a full inventory. 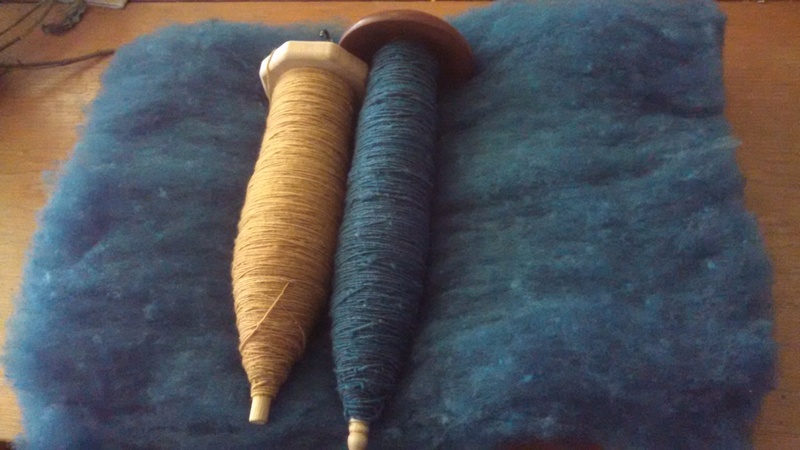 Targhee fleece (gold) and unknown “Sliver Roving” in “kingfisher” colorway. Unfortunately, we lost a couple of our best spinners when some of our staff retired, so we’ve been working on getting some of our new spinners up to speed. We fixed up our two working spinning wheels and have actually loaned them out to a couple of members, and some new members (who happen to have their own wheels) have joined in the past couple months. So we’re starting to get a little ahead, in terms of processing. 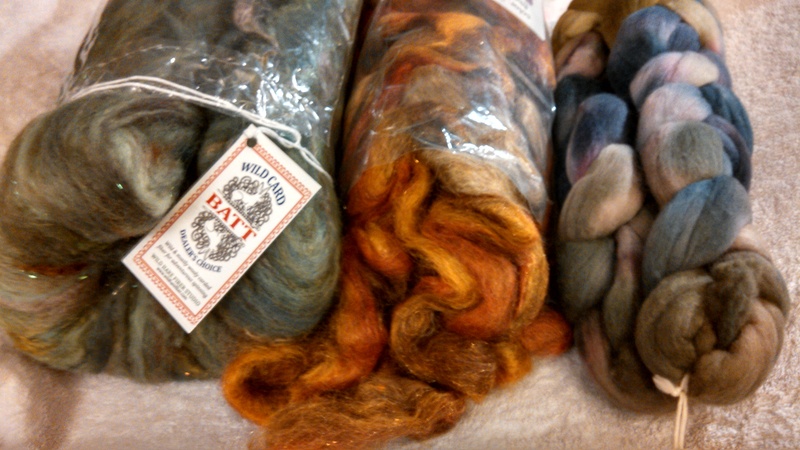 Lambie’s fleece was dyed with turmeric (with a few pieces pulled out to showcase coffee and black bean dyes). It’s a wonderful golden yellow, and still smells wonderful from the turmeric bath. 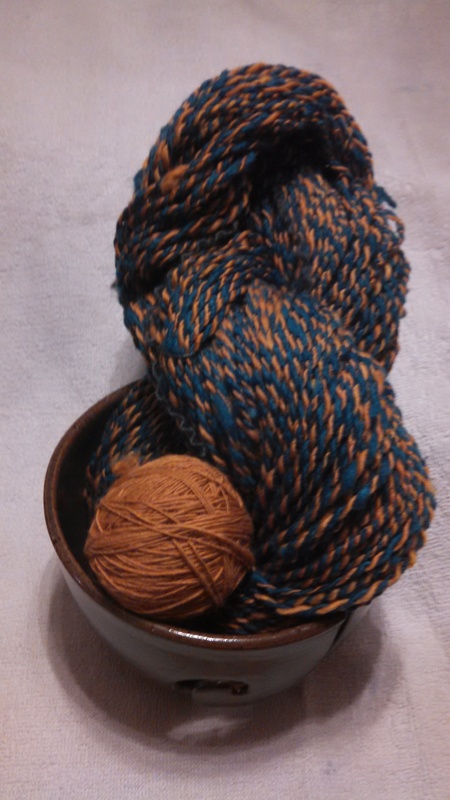 One of the new members took that home to finish carding, and another has started work on spinning it into yarn. Most of the processing I’ve been helping with is more on the washing/dyeing, carding end of things, but I wanted to help with the spinning. Unfortunately, spinning wheel prices being what they are (and knowing that Alvin and Raven would probably destroy it and themselves in a matter of minutes), that left me with the drop spindle. The drop spindle is old…the oldest way to spin fiber, that we know of, in fact. It makes sense. All you need is a stick, really. You don’t even need the little whorl you see on most modern spindles, or the hook that many contemporary spindles utilize. As part of a Sustainable Textile Skills series (try typing that over and over again in grant applications), we held an Introduction to Spinning class at the foundation, led by spinner-extraordinaire, Sylvia DeMar. Sylvia’s been spinning for over 20 years, and has probably spun any and every kind of fiber you can think of: plastic Easter grass, actual grass, steel wool…she’s done it all. So, when she says she can teach you how to spin, she can teach you how to spin. Ten of us sat down for two hours, spinning our fibers, dropping our spindles, and at the end, each of us managed to have a small skein of rather wobbly-looking yarn to show for it. 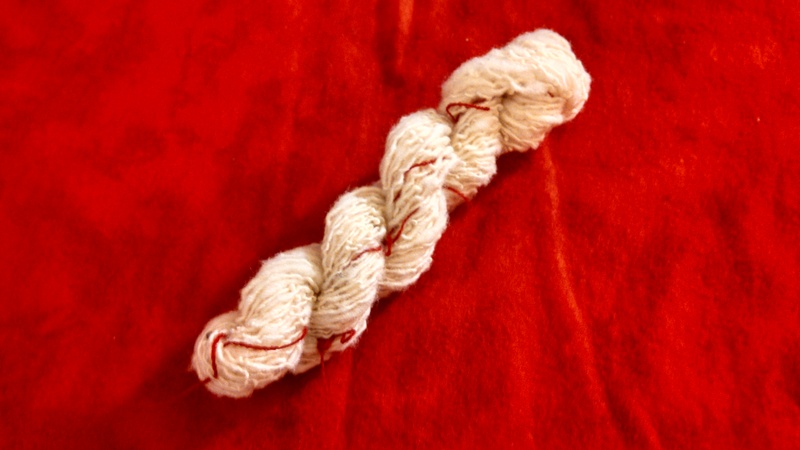 Sylvia says that it’s actually really hard to spin the really chunky, uneven yarn when you get really good, so we should be excited about the fact that we managed to spin the goofy stuff we did. She called it “art yarn.” Since Mother’s Day was that Sunday, I gifted Mom with my very first tiny skein of wobbly single-spun yarn. I was really quite surprised at how quickly the fiber spun up on the drop spindle. Of course, part of the speed was, undoubtedly, due to the fact that I wasn’t aiming for a particularly thin and even strand. I’ll admit that I was hooked on spinning that day. I left the park several hours later (after the workshop and the regular SNT meeting) and drove straight to Fibre Space, a little yarn shop in Old Town Alexandria. While the majority of the shop is filled with yarn and knitting patterns, there’s a small section along one wall that sells spinning supplies: drop spindles, roving, and ball winders. There wasn’t a whole lot in the way of drop spindles that day (they must have had a run on them recently, because I’ve been back and spotted a whole lot more on that trip), but I picked up a beautiful cherry/maple piece to start some spinning at home. Prior to the workshop, I had visited another yarn shop in Fairfax – Nature’s Yarns – and picked up some roving for workshop participants to use. The shop is on the smaller end, compared to some of the other locations in the area, but the selection is lovely, and they have a small corner for spinning supplies. It’s easy to overlook the corner…it’s to the immediate right, as soon as you walk through the door. I purchased two different hand-dyed rovings – both Blue-faced Leicester (recommended by Sylvia as a good staple length) – and took them to the workshop. The ladies there only used about half of one of them, which left me with a good deal to start spinning with at home. I wound up getting through both groupings of roving over the course of the weekend. Yay, spinning! The next week or so, I visited another of the local yarn and fiber shops. This time, it was a trip to Uniquities in Vienna. Oh, friends. I think I have found my new favorite hobby-shopping store. Uniquities had some lovely selections of fiber, spread throughout the store. I picked up some lovely faux cashmere, dyed blue and purple. It is so soft. I just want to rub it all over my face. Don’t look at me like that…you know you do the same thing with soft fabric. 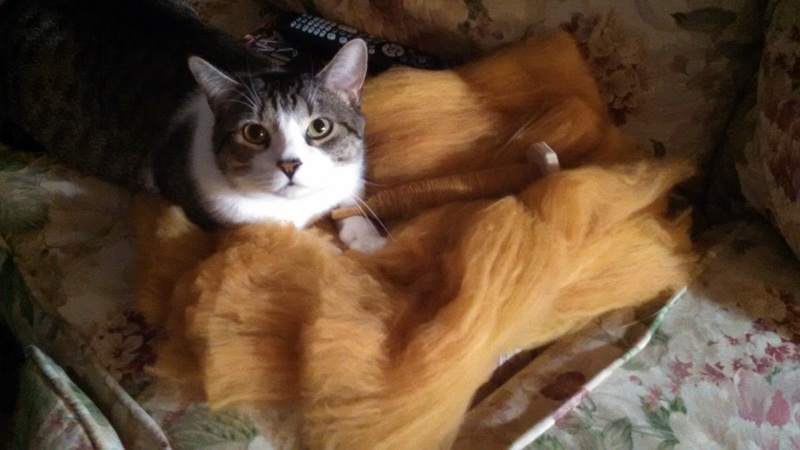 Alvin, convinced that he’s helping me to spin by parking himself on my batts of roving. stop in FibreSpace on a day when I was in Old Town, trying to drum up donations for an event, and picked up a really fluffy roving from a farm out in Washington…that I have vowed never to use again. I love the colors and it was soft, but it was hell to spin – kept breaking apart, still had a lot of vegetable matter left in it, for something that was commercially processed. Pretty soon into spinning it, I realized I was going to need something else to spin it with. Using it as a single just wouldn’t cut it. But what to do? About a month later, we were in the Vienna area again, and I picked up another two bags of fiber for spinning and plying. I bought a beautiful gold Targhee, to ply with the roving-that-almost-wasn’t, and a package of a light blue to combine with the faux cashmere (which is a bit slippy by itself). I also got a few more drop spindles, including to larger ones I plan to dedicate to plying. It took a while, but I’ve finally finished both the kingfisher and gold singles and have started work on my first plying attempt. It’s interesting, as I work through the plying balls, to see how the consistency of my spinning improved as I worked on both rovings. They both start out rather fluffy and thick, and then move on to a more uniform size. The one problem with the plying spindles is that they don’t have a little notch, like my cherry/maple spindle does. The notch helps to keep the fiber that’s already been spun in place, and keeps it from slipping out and flying all over the place as I spin the next section. I’ve solved the problem temporarily by using a small binder clip to hold the yarn in place, but I think I’ll probably need to add a small notch at some point. The finished 2-ply – approximately 284 yards! At the last Stitch ‘n Time meeting, Casey brought in her spinning wheel to let me have a whirl at it (see what I did there?) It took a while for me to get the hang of working the treadle at the right speed, and hold on to the damn leader thread and draft, all at the same time, but I finally got going, and managed to work up some thread on the bobbin. I was actually rather surprised at how thin and even I was able to manage, my first time using a wheel. Jeannie, one of our regular spinners, referred to me as “one of those.” My excuse was that I’ve been doing a lot of spinning on the drop spindle, which has helped to get a handle on some of the spinning. My very first wheel-spun single. I should have included something for scale. now. I think he might. I’ve found an interesting set of PDF plans, but I’m unsure whether I like the prospect of using a spinning wheel without a flyer. I’ll have to mull it over. So now I’ve added spinning to the list of crafts that I do. I think it’s going to become my go-to craft for when I’m sitting at home, during my occasional movie-watching, as I can pay better attention to the movie. I can also carry on an actual conversation with people while doing it, whereas crochet requires my attention for counting stitches. And it’s a lot cooler than quilting during the hot summer months in the DC Metro area. I have to admit, I kind of like the plying stage than the initial spinning stage better…this is probably because that’s when it starts to really look like yarn. Plus, that also means I’m almost finished with it, and can soon wind it onto and take it off the niddy noddy and VOILA! Yarn! Mom helps feed my spinning habit. I’ve started building up a small stock of fiber to be spun. These three selections were gifts from Mom. I’ve also got a short crate with large fluffy batts of multi-colored wool (I borrowed the drum carder from work to even out some of the color). The cats, I will mention, have been rather well behaved about this new addition. So far. The other day, while I was plying, Alvin parked himself by my feet and stared rather intently at the bowl the blue single was being pulled from. Raven snuck up behind me, on another occasion, and looked like he was planning to pounce on the string. That’s the problem with having two cats who love yarn and string. I’ll have to keep on the look-out.